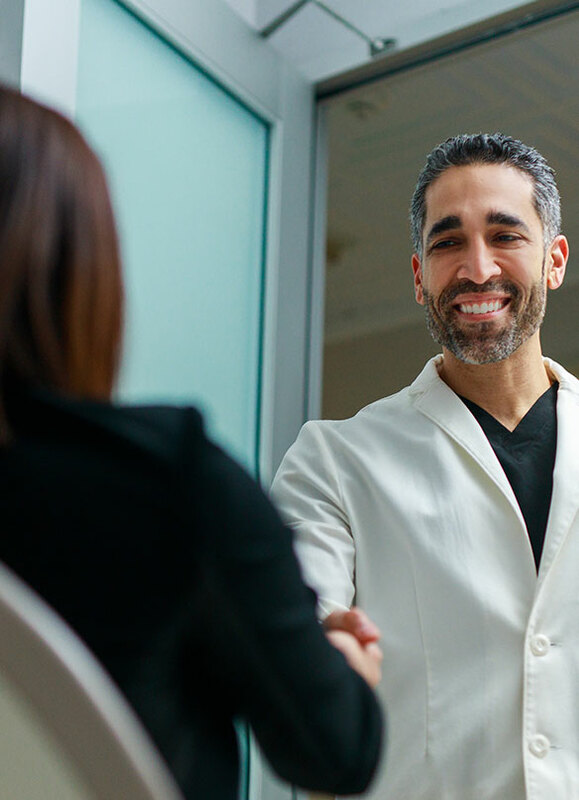 Dr. Nima’s passion for outreach beyond his geographic comfort zone is a natural outgrowth of his goal of “disrupting” the field of plastic surgery, of seamlessly integrating his chosen occupation into an entire “beautification” lifestyle. In such a world, plastic surgeons would not simply perform a procedure and then evaporate from their patients’ lives. Rather, they would more closely resemble family doctors, who maintain long-term, fully-developed relationships with their patients. Geographically remote patients, in Doctor Nima’s opinion, do not simply find a one-time, disconnected doctor. Instead, they find a partner invested in developing a relationship. With this in mind, Dr. Nima encourages patients who are located outside the City of LA., to explore our website, give us a call, and consider Eos Rejuvenation for your individual needs. To make this easy for you, we have developed a streamlined, 5 step process to facilitate the intake of patients residing outside LA. First, we encourage you call us. During this initial call, you can discuss your needs, desires, and requirements with our team, and our team will advise you of the services we offer that could address your list. Once this initial rapport has been established and an initial plan has been proposed, you will schedule a complimentary video conference (e.g. Skype or Facetime) with Dr. Nima. In this initial consultation you will be able to thoroughly explore your desires and concerns and Dr. Nima will discuss your options. For instance, during a Skype session, Dr. Nima can review a “self-portrait” you have sent in advance, to better describe how a particular may enhance you appearance. Don’t worry, our staff, provides you with detailed instructions on how to take photos of yourself for analysis. Additionally, Dr. Nima will review medical records and/or any necessary blood-work, if previously sent in by you. Once you are confident that you wish to move forward, our staff is experienced at handling all of your non-medical needs. We will make recommendations for hotels and transportation and advise you of various amenities available nearby. Upon arrival in L.A., you will travel to our offices in Beverly Hills where you will find that the majority of your paperwork has already been completed. Additionally, your surgery will already have been scheduled. All that will remain will be for you to fill out some final paperwork. We will also give you a post procedure kit including supplies that you will need, herbal medications to reduce bruising, and instructions for an easy recovery. Post surgery, our staff will help coordinate and facilitate any of your recovery needs. For instance, we can arrange your transportation between our office and your hotel. Additionally, we can provide recommended diets where appropriate. In short, your entire stay and experience is our concern. To us, you’re family. You’re not just a patient. And we take care of family every step of the way. Contact our office in Beverly Hills for more information at (310) 772-2866.